I had a problem with severe drift in DEC for my Altas EQ-G mount. I did a tear down and rebuild for both DEC & RA axis. The DEC now works perfectly. But RA, which was working well before the "operation" is not working well. I have tried several adjustments on the worm-gear drive (following the usual procedure). As far as I can tell, it's a hit and miss deal because you cannot see the worm gear meshing with the RA axis gear. The only problem is that I can't seem to "hit" the sweet spot for this worm gear. Is there any secret to this thing? In case it helps, you may want to look at my most recent attempt at guiding. I attach my PHD2 guidelog. 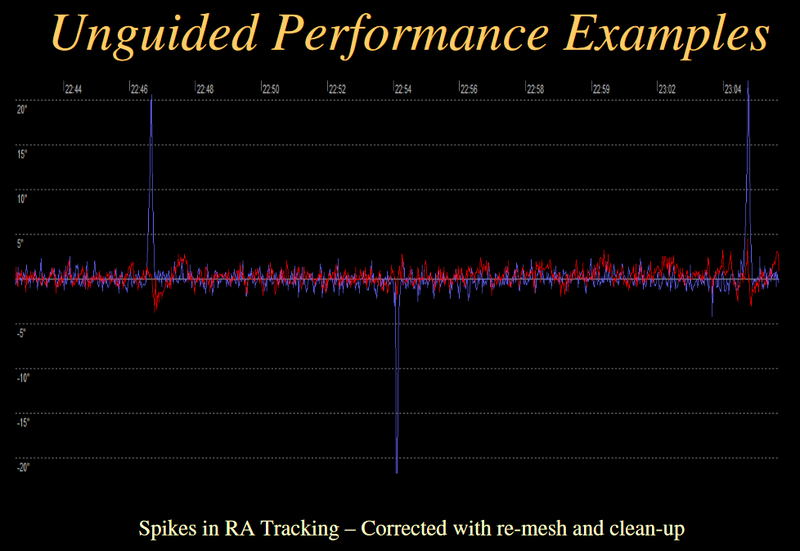 You can see in the 3rd log (the one for 25 minutes) that there is definitely something periodic going on in the RA axis that messes up the guiding. i'm no expert but i think you may need a re-mesh and clean up. Edited by geethq, 19 March 2019 - 03:04 AM. In case you haven't done it, the worm spacing should be adjusted by sound, not by feel, in the Atlas mount. That is the best way to ensure the closest spacing without binding and if is fairly easy to accomplish. What I am looking for (or rather what do I hope to hear) ??? I can adjust the two spacing screws that the mount is almost silent when operating ... or very noisy ... or anywhere in between. One thing I tried was to adjust the two spacing screws so that the mount showed signs of mild binding. Then I loosened that setup ever so slightly. I thought that would give me the best spacing. But I still have some "wiggle" (backlash?) in the RA ... which was NOT there before I did the tear down and re-build. The irony is that RA was working fine before I did the tear-down / rebuild. I was trying to fix the DEC, which I did. Now, it's the RA that is not behaving properly. The adjustment is a trade off between noise and backlash. In general, the noisier the axis is, the less the backlash is. At some point however, the tightness of the gears can begin to accentuate the error as well. Just release the axis clutch and slew it at top speed while making the adjustment. With the Atlas you can tighten the spacing until the worm binds and the motor skips. From there back it off as little as possible so that the worm doesn't bind and the axis does not sound like it is struggling. At that point you will usually have the spacing as good as you can get it. Do not obsess over the adjustment though. At some level there will always be backlash in this mount. Without it, the worm will bind because it is not spring loaded. The goal is to minimize the backlash, not eliminate it (although you can frequently get it to the point where you can't really feel the backlash). The DEC is the most important for minimizing the backlash since the RA can be off-balanced to take up backlash. I think, of all I have read, this describes the situation with the EQ-G perfectly. So, I have managed to get the mount working as well as it can. DEC has no backlash at all, as far as I can tell, and the RA has some backlash but I'm managing it with off-balancing of the CW. So, all in all, many thanks for the advice.